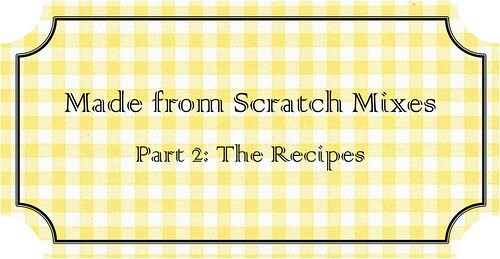 If you're just joining me here, check out Part 1 of the Made from Scratch Mixes series and learn how to make a mix from your favorite recipes! Pancakes are probably one of my favorite breakfast foods. I love having my favorite "from scratch" recipe as easily accessible as a mix. It seriously makes those mornings so easy (let's be honest here - they seem to show up for dinner about as often!) This makes big, fluffy pancakes. If you prefer yours thin and crispy, just add more milk. Whisk together milk, eggs, and oil. Stir in the Pancake Mix until just combined - it's ok if the batter is lumpy - you don't want to over mix. 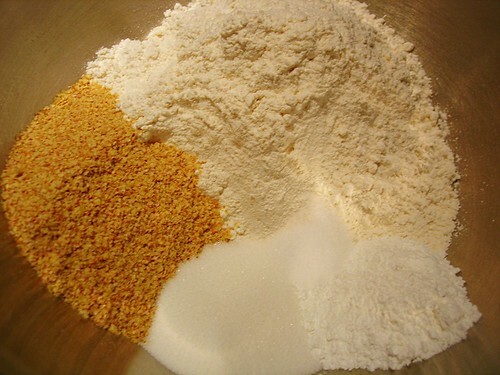 Combine dry ingredients in a large mixing bowl, making a well in the center. In a separate bowl, stir together milk, eggs and oil. Pour milk mixture into the dry ingredients and mix together. Stir until just combined, being careful not to overmix. It's ok if it's lumpy. Butter a frying pan or skillet that has been heated to about 300 degrees F. Spoon pancake batter onto pan and spread into 5 inch circles. Cook until bottom is golden brown and bubbles appear on top of pancakes. Flip and cook for another couple minutes, until both sides are golden brown.